Hotel Partners - The Great New York State Fair! Conveniently located off the New York State Thruway (I-90) & I-81, the Maplewood Suites Extended Stay has the proximity to the New York State Fairgrounds that makes a perfect fit for vendors and visiting guests. The Maplewood Suites Extended Stay sits only miles from all major attractions in the Syracuse, New York area. With an array of accommodations throughout our suites, you will enjoy amenities such as complimentary wifi access, on-site bar/lounge, a hot deluxe continental breakfast, featuring a parfait bar filled with fresh fruits and toppings, 24 hour lobby access including hot coffee, hot chocolate and tea, complimentary shuttle service (based on availability) from 5:00am-11:00pm daily, safety stove tops, state-of-the-art 24 hour fitness center, indoor heated pool and so much more! Whether you’re staying for a night or a week, you can expect to enjoy luxury and sophistication at our newly redesigned, all-suite Syracuse, New York location. Reserve your rooms at the Maplewood Suites Extended Stay today! 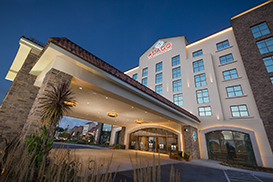 del Lago Resort and Casino is proud sponsor of the New York State Fair. Book online today and receive a special rate with rate code: NYFAIR. EXPERIENCE EXTRAORDINARY - As the area’s #1 Resort and Casino we offer 1,956 Slot Machines and 99 Table Games, including 14 Poker tables. Don’t miss out on our electrifying entertainment all year in The Vine Showroom, dining options for every taste, including the award-winning Portico by Fabio Viviani, and a luxurious 205 room hotel with 14,000 square foot European-style spa. We have everything and more for your next gathering or celebration. Visit www.dellagoresort.com for details. Conveniently located off the NYS Thruway Exit 41. 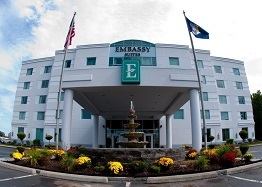 The Embassy Suites Syracuse is easily accessible to I-90 and I-690 just 15 minutes from The Great New York State Fair. Syracuse Hancock International Airport and Downtown are also just minutes away. Enjoy style and sophistication at our all-suite hotel. During your trip, unwind in a spacious two-room suite with everything you need to feel at home. Meet with family and friends for complimentary drinks and snacks at the Evening Reception* in our open-air atrium. Indulge in a free made-to-order breakfast each morning or relax with a meal in the casual and comfortable atmosphere of The Atrium Grille. We offer the Embassy BusinessLink™ Business Center so you can stay connected. Our fitness center is equipped with state-of-the-art machines and free weights. After your workout, take a refreshing dip in our indoor pool or relax in our hot tub. Settle in for a relaxing stay at our new, vibrant Embassy Suites by Hilton Syracuse Destiny USA hotel. Explore New York's largest shopping, dining, outlet, and entertainment destination. We are also just minutes from NYS Fairgrounds, downtown Syracuse, six miles from Syracuse Hancock International Airport and three miles from Syracuse University. Take our complimentary shuttle anywhere within a six-mile radius of the hotel. Wake up each morning to a free made-to-order breakfast featuring omelets with your choice of fillings, potatoes, bacon, fruit, pastries and more. End a busy day with drinks and snacks at the complimentary Evening Reception* in the beautiful atrium lounge. Our on-site restaurant offers comfort food and appetizers in a relaxed atmosphere. Daily room service is available, and our 24-hour sundries shop offers premium snacks, beverages and toiletries. Visiting the Syracuse area for the Great New York State Fair or one of the amazing events that are hosted during the year at the NYS Fairgrounds and we welcome you as our guest. Our hotel is situated in Liverpool, just under a 15 minute drive to The Fairgrounds and the Salt City’s most popular attractions. The property is conveniently located just off NYS Route 481 and close to The NYS Thruway (Interstate 90) and Interstate 690. Indulge in some retail therapy at Destiny USA or opt for a day in the great outdoors at Onondaga Lake Park. Enjoy a modern guest room and take advantage of our premier services and amenities, from complimentary Wi-Fi to a clean and fresh Hampton Bed®. Swim laps in our new indoor swimming pool, or work out in the fully equipped fitness center with a range of cardio machines. Start each day with a Hampton’s complimentary Hot Breakfast and try our famous waffles. If you're in a rush, simply grab one of our free Hampton On the Run® Breakfast Bags, available Monday through Friday, for a quick healthy meal to go. Whatever the reason for your time in Syracuse, let the Holiday Inn Express Syracuse Fairgrounds be the place for you. The hotel is just minutes from the fairgrounds and offers a complimentary shuttle daily throughout fair events! Located just one mile off I-690, the hotel is perfectly located whether you’re visiting the Fairgrounds, Destiny USA, Downtown Syracuse, or just passing through. Each guest room is equipped with a refrigerator and microwave, as well as a complimentary full hot breakfast starting at 6am every morning. The hotel also offers complimentary WiFi and a fitness center open around the clock. To top it off, we offer an indoor heated pool and hot tub to help you relax and unwind at the end of your day. Discover a unique blend of elegance, history and personalized service at the Jefferson Clinton Hotel. Perfectly nestled in downtown Syracuse’s historic Armory Square district, and just 5 short minutes from the NYS Fairgrounds, our luxury accommodations provide the ultimate in comfort for both business and leisure travelers. With an array of accommodations that span from specialty rooms to luxury suites, you will enjoy amenities such as free internet access, a complimentary hot breakfast with made to order omelets, 24 hour fresh fruit and coffee service in our lobby, complimentary bicycle rental, movie rentals and other perks all adding your enjoyment! All suites are equipped with kitchenettes and every room has premium mattresses, flat screen TV with DVD player, minibar and a microwave and refrigerator. Whether you plan on staying for a night or a week, we offer everything you need. Our central location in historic Armory Square puts you right in the center of it all. Fantastic shopping and dining are right outside our doors and we’re a quick 2 miles from Destiny USA. Reserve a room at the Jefferson Clinton Hotel today to experience warm, personalized service and some of the most charming accommodations in Central New York. As a NYS Fair hotel partner we look forward to introducing you to a new experience in downtown Syracuse. Call the hotel directly for special NYS Fairground Event Rates! Whether you are traveling to the fairgrounds for a Horse Show, Syracuse Nationals, the Great New York State Fair or any other event, make the Quality Inn & Suites Fairgrounds your home away from home. Located off I-690, the hotel is less than 5 miles from the fairgrounds. The Quality Inn & Suites Fairgrounds is a newly renovated, full service hotel that was designed with you in mind. Our well-appointed guest accommodations combine to offer king or two double beds, flat screen TVs, free Wi-Fi and even a complimentary deluxe hot breakfast. We also have a complimentary 24-hour Business Center available for your use, as well as Guest laundry facilities on site. After a busy day, come back to the hotel and relax with a delicious meal in our restaurant or enjoy a cocktail at the lounge located on premises. No need to leave your pet at home, we have Pet Friendly Rooms available. Now offering complimentary shuttle service to the Fairgrounds based on availability from 8:00am – 10:00pm daily. Planning to attend an event at the NYS Fairgrounds? Choose the newest Hotel in the Syracuse area! Located just 4 miles from the NYS Fairgrounds the all new Tru by Hilton Syracuse-Camillus is centrally located just off I- 690 & NY- 695. The Tru by Hilton Syracuse -Camillus is located within Township 5 the areas only mixed use development allowing dining, shopping and entertainment all within walking distance of the Hotel. This Tru offers a one of a kind indoor sport court with basketball, soccer, volleyball, lacrosse, pickleball, just to name a few. Say hello to a brand-new hotel experience at a Hilton that's vibrant, affordable and young-at-heart. It's energetic, yet relaxing and comfortable. Tru offers comfy platform beds, 55” TV and complimentary “Top It” morning breakfast bar. Our Eat And Sip Market offers 24/7 snacks and soda, beer and wine for purchase. Come join us at Tru! Join us at the Wingate by Wyndham Liverpool/Syracuse during your visit to the NYS Fairgrounds. 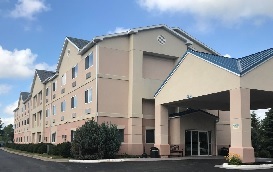 Conveniently located off Highway 481, offering easy access to Highway 81 and Interstate 90 as well as, Downtown Syracuse, Destiny USA, and Syracuse Hancock International Airport. Our hotel is 100% non smoking and offers fresh clean rooms reflecting the Wyndham standards. We offer standard rooms with 2 Queen Beds or 1 Single King. We also have our Deluxe King Sofa Rooms available that have a sitting area with a couch that pulls out. All of our rooms are equipped with a fridge for your convenience. 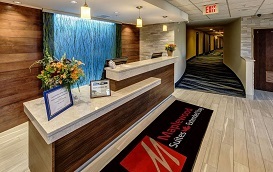 During your stay at the Wingate by Wyndham Liverpool/Syracuse, keep connected with our complimentary WIFI, local calls, and 24 hour business center. Wake up to our freshly brewed gourmet coffee and full hot breakfast, including waffles, eggs, omelets, sausage, and much more! Rejuvenate with a dip in our indoor heated pool or take on a vigorous workout at our nearby Aspen Fitness Gym (complimentary passes offered at front desk). Whether you’re coming to town for business or leisure, let the Wingate by Wyndham Liverpool/Syracuse be your choice while visiting... make sure to also ask about our State Fair ticket packages!